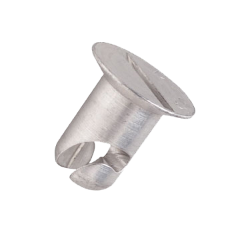 These non-retainable studs are flush (countersunk) head and available in either zinc plated steel with a clear chromate finish to prevent corrosion or bare aluminum which can be anodized. They are silver in color, DFARS and RoHS compliant. Additional sizes, materials and finishes are available upon request (minimums may apply). If you have any questions or need technical assistance, please Contact Us for details, we will be glad to help. Aluminum Studs are Bare Finished and can be Anodized if Desired to Prevent Corrosion. They Have a Bright, Silver Color Finish (DFARS and RoHS compliant).